I first came across Naheed when listening to my favorite podcast/radio show CBC Dispatches. She was reporting from Afghanistan and telling a story about determining the “barometer of success”. She was speaking with shop keepers and business owners and reporting on things such as how long people were going without a power outage. First of all, any correspondent for Dispatches is someone I want to take for lunch – but secondly, I was intrigued by Naheed and how she was right in the midst of Afghanistan, getting to know the people and what life is really like over there – not what we hear on the daily news. So I Googled her, found her on Twitter and invited her with a Tweet. 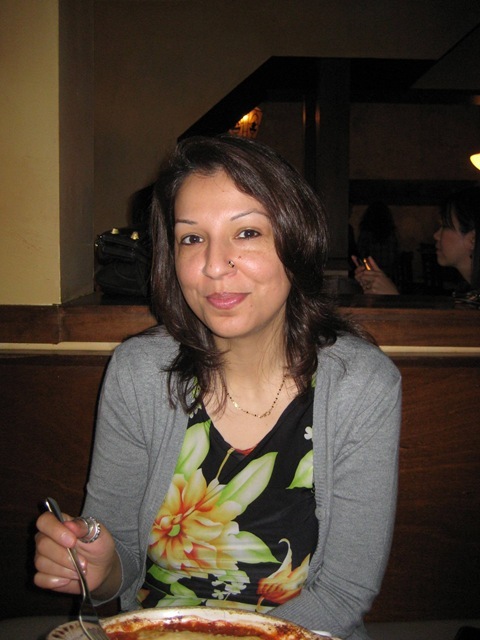 Aside from Dispatches, Naheed is a freelance journalist and has been working in radio for nearly nine years after ten years in print. She produces documentaries and is currently working on an online resource for the upcoming Afghanistan election. She also regularly covers Swat Valley in Pakistan and is planning an upcoming trip to Bosnia. We ate at the Queen Mother Café on Queen Street West. It’s such a staple of this area and has a beautiful patio but the weather was being strange – sun then rain then sun then downpour (welcome to the summer of 2009). So we didn’t chance it and ate inside. Naheed had the cannelloni and I had a grilled vegetable wrap with goat cheese – both came with a small mixed green salad and we both drank water. I am in the midst of a personal experiment to go vegetarian for July (this is likely a blog post on its own). I have always enjoyed grilled veggie sandwiches and wraps so I didn’t mind but I am finding the lack of veggie options when I go out quite shocking. All in all though, the service was great and the food was delish. The total bill was $23 with tax. I think the lesson of this lunch was almost simple in its message but something that is difficult to always remember. The feeling I left the lunch with is that you cannot ever really know what a place and its people are like until you’ve been there. I consider myself to be pretty well informed. I am a news junkie and I always grab news and stories from multiple sources. Beyond reading and watching news regarding current events, I try to watch documentaries, read novels by international authors set in many other countries and just overall, try to learn as much as I can about what’s going on in the rest of the world. But the truth is, I have never really travelled far off the beaten path and have never met people living and surviving in a warzone or living in complete poverty. And no matter how much news I watch and read, I will never know, not only what their lives are like, but what they’re like – their dreams, passions – or, even more basic, their pastimes and hobbies. For example, did you know that Afghanistan culture is very family oriented and one of the most popular activities on a day off is to picnic? Naheed taught me that one. The experiences Naheed has had and the things she has seen and learned along the way are definitely more than what can be captured in one lunch. But I hope to have gotten a small glimpse. Naheed talked a bit about being a journalist and reporting on the types of stories that she does. She says in order to be able to move on to the next story, she can’t stay emotionally connected. She says she always remains intellectually connected but has to find a way to keep her emotions out, in order to continue doing her job. She even mentioned another journalist, Stephanie Nolen from the Globe and Mail, who is the South Asian correspondent currently based in New Delhi. Naheed read an article that Stephanie wrote while reporting on the people of Rwanda ten years after the genocide and she still wonders how Stephanie was able to move on from that story. Naheed says she often goes back and reads that same article and it still gets to her every time. We talked about Iran and how it has been a progressive Middle East country in many ways, with a population that is extremely educated. This is another place that was mostly shown in the media as a reflection of its leader and, recently, we have seen this is definitely not the case. I also wanted to ask Naheed, what is someone like me to do? I see horrible stories on the news of girls being attacked for going to school and I want to help but don’t know how. She said it’s not easy to help. This is a country that is extremely conservative, 80 per cent rural, with tribal and sectarian divides and women, at times, are still seen very much like property. She suggested donations to charities that have tangible results such as those offering medic al care. Women are dying in childbirth when they could be easily saved with proper medical care. Proper care for these mothers is very much a women’s rights issue and a way for us here in Canada to help. I really enjoyed my lunch with Naheed. I feel like I always have follow-up questions after I watch the news and I was able to get some insightful answers from Naheed. I could honestly have talked to her, asked her questions and listened to her stories for hours. Hopefully we can meet up again one time. Now I think it’s time for me to start a secondary “lunch set up” blog because I think Stephanie Nolen and Naheed should get together.